When Daniel Lubetzky started KIND Healthy Snacks in 2004, he aimed to defy the conventional wisdom that snack bars could never be both tasty and healthy, convenient and wholesome. A decade later, the transformative power of the company’s “AND” philosophy has resulted in an astonishing record of achievement. KIND has become the fastest-growing purveyor of healthy snacks in the country. Meanwhile, the KIND Movement—the company’s social mission to make the world a little kinder—has sparked more than a million good deeds worldwide. In Do the KIND Thing, Lubetzky shares the revolutionary principles that have shaped KIND’s business model and led to its success, while offering an unfiltered and intensely personal look into the mind of a pioneering social entrepreneur. Inspired by his father, who survived the Holocaust thanks to the courageous kindness of strangers, Lubetzky began his career handselling a sun-dried tomato spread made collaboratively by Arabs and Jews in the war-torn Middle East. Despite early setbacks, he never lost his faith in his vision of a “not-only-for-profit” business—one that sold great products and helped to make the world a better place. While other companies let circumstances force them into choosing between two seemingly incompatible options, people at KIND say “AND.” At its core, this idea is about challenging assumptions and false compromises. It is about not settling for less and being willing to take greater risks, often financial. It is about learning to think boundlessly and critically, and choosing what at first may be the tougher path for later, greater rewards. By using illuminating anecdotes from his own career, and celebrating some past failures through the lessons learned from them, Lubetzky outlines his core tenets for building a successful business and a thriving social enterprise. He explores the value of staying true to your brand, highlights the importance of transparency and communication in the workplace, and explains why good intentions alone won’t sell products. 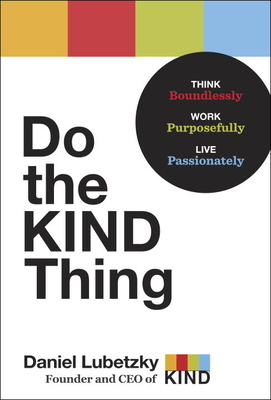 Engaging and inspirational, Do the KIND Thing shows how the power of AND worked wonders for one company—and could empower the next generation of social entrepreneurs to improve their bottom line and change the world. Daniel Lubetzky is a pioneering social entrepreneur known for integrating social objectives with sustainable market-driven forces to forge new business models that build bridges between people. He is the CEO and founder of KIND Healthy Snacks and the KIND Movement. He is also founder of PeaceWorks and OneVoice, and cofounder of the apparel company Maiyet. Lubetzky has received numerous awards and recognitions for his humanitarian efforts and his business practices; among them he’s been named one of America’s Most Promising Social Entrepreneurs in BusinessWeek, one of 25 Responsibility Pioneers by Time, one of the Creativity 50 by Advertising Age, and one of the 100 Most Intriguing Entrepreneurs at the Goldman Sachs Builders and Innovators Summit. He has received Entrepreneur of the Year awards from both Entrepreneur magazine and Ernst & Young. He lives in Manhattan with his wife and four children.